The 10 minutes break before the next drive off at the old bus park was turning into a roast session for the 13-year-old, Bijay Malami. It has already been four months since he became a bus conductor but as his driver complained, he still didn’t know how to whistle. 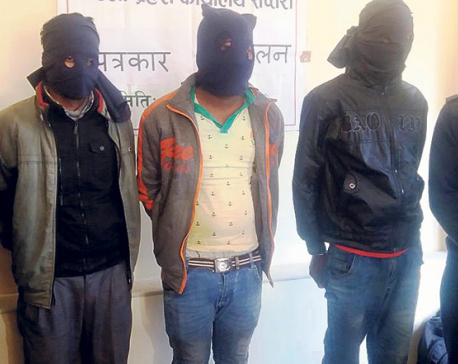 To the other lingering drivers’ and conductors’ amusement, Ramesh Tamang, the driver, crunched up his entire face and gave his own rendition of Malami’s desperate attempts at whistling. A gale of laughter followed the reenactment and though the 13-year-old tried to protest, he too couldn’t suppress his smile. He had to admit it was funny and, as he put it, lately, he has been experiencing a lot of this kind of fun, from his “new life”. While he has been working and hanging out with adults these last four months, Malami assumes his peers at his school in Kagati Gau on the outskirts of Kathmandu are probably feeling the pressure of appearing for the District Level Exams later this year. He is relieved not to have to go through all that. Then he boasts of the money he is making. With daily earnings of Rs 200 – Rs 250 per day and a fixed monthly salary of Rs 2,000, he has been getting Rs 8,000 every month ever since he started working. Though his month, he says, he has a feeling it might increase and he is quite stoked about it. In fact, he seems to be in awe of himself. Apparently, he has never seen that much money all at once before. Tamang, the driver, quietly listens in the background as Malami continues with his enthusiastic explanation. When asked for his opinion on the 13-year-old’s stance, Tamang simply shrugs. “A kid should obviously be in school. Education should be given priority but it’s not all that simple for everybody. Circumstances, one’s background, and capabilities matter. If he can’t or doesn’t want to study, at least, he is working and earning,” says Tamang. He also believes that Malami is going through some family troubles but the youngster refuses to talk about it. Tamang agreed to make him his conductor as a favor to one of Malami’s cousin brother who is a friend and also a bus driver. Hiring minors as bus conductors is indeed a common urban phenomenon in Nepal. So much so we don’t even give it a second thought when we see one at the stops anymore. Even though, every now and then, we hear somebody pass comments on some of these young conductors’ quick calculation skills or energetic calls and witty comebacks, we rarely question what brings them there to begin with. The sight of child bus conductors has become just that common. Bina Kunar Thapa, program officer at the International Labor Organization (ILO) Country Office for Nepal, though continues to be troubled by the issue. “This isn’t only child labor, it’s a lot more serious concern as it presents hazard risks as well. These minor conductors are exposed to health and safety risks on a daily basis. Our country actually has policy that prohibits such young recruits, however, we haven’t been able to implement them,” informs Thapa. The way she sees it, it’s also not only about getting the transportation sector to enforce strict monitoring system. 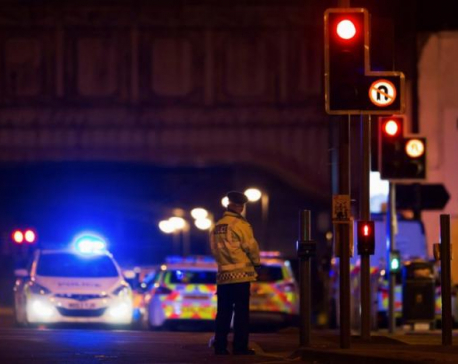 There are other factors to be taken into serious consideration as well. Thapa believes it’s important to examine the root cause of this trend and then, accordingly, provide monetary support, alternative means of income or even rehabilitation options, if necessary. In absence of such comprehensive support system, it’s reportedly been difficult to curb Nepali children from turning to such labor options. 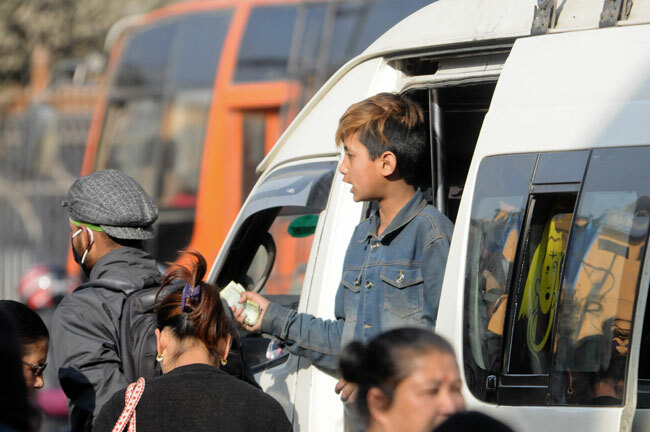 Indeed child rights law may view this as a problem, but many Nepali teens who have been employed as conductors actually appreciate the opportunity. Nirjan Maharjan, 15, currently considers it the most convenient means of earning a living. He shares he decided to work as a conductor because while studying in his hometown of Sindhupalchowk, he was never interested in academics. He was also too embarrassed of repeatedly flunking his class. This was an easy way out. However, Maharjan doesn’t want people to misjudge him. In his short working experience, he had discovered one of the disadvantages of being young was not being taken seriously. He explains that he isn’t aimless, he harbors ambitions as well. “Sometimes I feel like you get pushed around and occasionally even screamed at just because you are smaller and younger than others. That’s the only part, I dislike about my job. But I do believe in working hard,” says Maharjan. He eventually wants to own a vehicle of his own. Even though it’s barely been about seven months that he began working as a conductor, he reveals that he has already given up on hopes of getting an education. “Lagankhel ko hawa lage pachi, k ko school?” he laughs. Currently he earns around Rs 250 -300 per day with a fixed monthly salary of Rs 2000 and he has been investing his earnings with the help of a financial institution. And he even grumbles about trying to convince his friend Suman Ghimire, 14, to do the same. Maharjan casually mentions that they end up having these kinds of serious talks every now and then over a smoke or two. He even bribed Ghimire with two cigarettes to talk about his own future plans. Ghimire, though initially coy about speaking, declares that his biggest dream is to get married. He also reveals that he has never attended a day of school but he still wanted to help his farmer parents out by being financially independent. He apparently felt that being a micro bus conductor was way more adventurous then working in the fields. In between the standard four to five trips around Kathmandu and Lalitpur, he has also had the chance to travel to Dhulikhel, Dharan and Butwal. He looks back on these memories as highlights of his life so far. 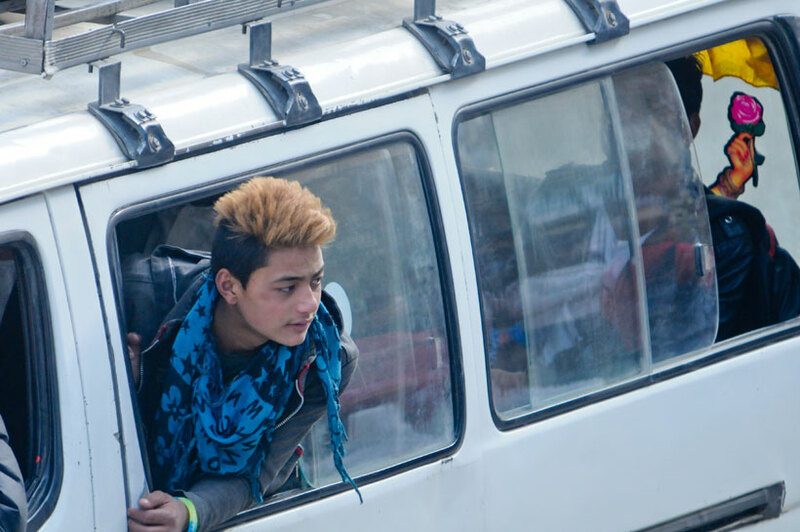 Ramesh Tamang, the driver, knows all of these boys and having once been a conductor himself he admits he can see where they are coming from and even relate to them to a certain extent. Does he believe they are on the right path though? Tamang assures us (having been through it all himself) that they are making the most of their circumstances, and that there will be more children following their footsteps till Nepal undergoes a complete socio-economic overhaul.